Vanguard News Network » Blog Archive » The Power of the Left: Where Does It Come From? The Power of the Left: Where Does It Come From? 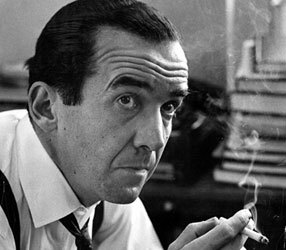 (Above: famed “journalist” Edward R. Murrow, who could make, or break, anyone in America). Maybe I’m just not sophisticated enough (my idea of gourmet food is a cheeseburger), but I’m not sure I agree with that Overton Window thing. It seems to me that the Left gets most of its power from the left-wing, mainstream media, which daily promotes leftist ideas: race-mixing, faggotry, feminism, etc.. Heck, Martin Luther King Jr. was built by the media – he’d be a nobody without it. And anti-communist Sen. Joseph McCarthy was crucified by the same media – even the “greatest newsman” Edward R. Murrow jumped onto the anti-McCarthy bandwagon by defending an “innocent” Black woman named Moss who was “victimized” by McCarthy; Murrow destroyed McCarthy’s reputation; but later it was discovered that – surprise! – Moss was a Communist party member, just like McCarthy said.